In January 2018 I resolved to camp every month of the year. By the end of January I had failed in my resolution. In 2019 I set a more reasonable goal of “getting outdoors more” and making good use of brief opportunities to walk, camp, cycle etc. Last month’s activity was a Manchester canal walk. I hoped February would be a little more adventurous. I love cold weather and was desperate to spend a night out in it. Not having enough time for a long walk (or for a circuitous public transport journey), I parked in Llandegla and headed south on Offa’s Dyke Path. There’d been no fresh snow for a few days but the cold temperatures had kept the pavements icy and the hills a patchy white. I’d been reading up on the difference between different types of twilight and reckoned that – with sunset at 1659 – I’d need to have found somewhere to camp by 1745 at the latest if I wasn’t to need my headtorch. I started walking just before 4pm. Llandegla seems to have become a favourite walking destination for me in the last few years and I didn’t need to refer to my map often. The snow got deeper and cleaner as I moved further away from the village. When out of the forest I kept an eye out for flat patches that I could camp on. I’d half planned to reach Esclusham Mountain before camping but ran out of daylight so I headed for somewhere that would hopefully not be easily seen from the path and would have running water nearby. I found a flat, level area (with a reasonable phone/data signal) and cleared the snow. I fumbled with the poles on my Vaude bivi and actually ended up reading the instructions! I think they say something about “This tent is designed to be easy to erect, so if it’s not easy you’re doing seomthing wrong”…… but I always find it a faff to get the poles into their little pockets. Maybe I should practise in the daylight when my fingers aren’t turning into icicles? The stars were already starting to twinkle by the time I was in my bivi at just after 6pm. The forecast had promised temperatures down to -5 degrees C and I could tell that it was going to be a cold night. I’d taken lots of clothes and was glad of them. I think the most important thing when camping in the cold is to be decisive and act early. Do not hope to stay warm; put on extra layers as soon as there’s any suggestion that you might be starting to cool. And if that means stripping off some outer layers in order to put on an extra mid layer then do that before you start to shiver. I went to bed in my Ron Hills, socks, long sleeve base layer, T Shirt, light Polartec fleece jumper, light bodywarmer, and Balaclava with a polar Buff on top. In the night I put a Buff round my feet [Oh, WHY did I not bring my down booties? ], draped another fleece over my hips and put on my windshirt. This was in a -10 down sleeping bag which is usually toasty. At no point was I cold, but I was beginning to wonder what my plan was if the weather got much colder. I could have put on my waterproof trousers and my Paramo smock and I wasn’t wearing any gloves, so I still had some extra options. Something which made me laugh was when I started thinking about how to spots signs of hypothermia. Poor decision making is one …….. but here I was lying in a posh bin-bag in the snow on the coldest night of the year so far ….. so maybe this was one symptom I would have to disregard in myself! 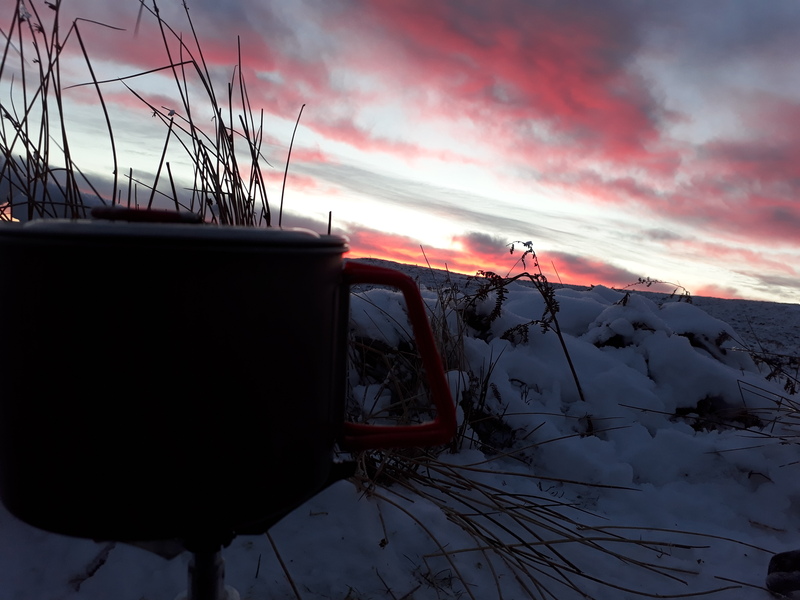 I’d taken the Vaude bivi as I thought it would be warmer than a bivi bag but, on reflection, there was a flaw in my reasoning. The Vaude bivi is definitely warmer if it’s fully zipped up but that means that breath condensation is a big problem. In the morning I had snow showers inside the bivi every time I moved. A simple bivi bag would not have been so wet inside, but I would probably have wanted a mini-tarp shelter to keep the frost off my kit. Keeping my equipment from freezing was a matter of prioritisation as I could not double-wrap everything or put it inside my sleeping bag. I wrapped my boots in a bin bag and then wrapped my waterproof trousers round them and put them behind my knees [I’m a side sleeper]. They were fine. In case my water bottle froze, I put some water in my pan before I went to bed so that I could definitely have a hot drink in the morning. The water in the pan froze but the water bottle didn’t! My midnight snack was a frozen Snickers bar which I snapped in two. I kept my electronics in my sleeping bag with me. I woke a couple of times in the night, but I always do. I would have been more comfortable in a tent but that would have taken more planning and needed more time to make sure I found a suitable pitch. Would I bivi out in such cold weather again? Yes, but I’d take my sleeping bag liner, my down boots and probably use my Rab Survival Zone bivi bag instead. 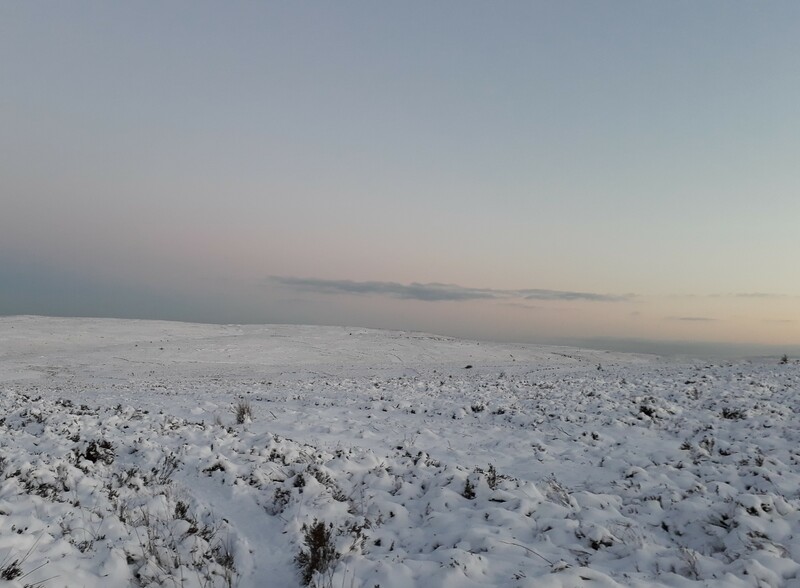 This entry was posted in Camping, Gear, Walking and tagged cold, llandegla, snow, Vaude bivi. Bookmark the permalink. It sounds as though you had a good trip. Well done for getting out there and doing it, whilst us wimps thought about it but stayed at home! Yes, short but sweet. Any camping trip is good for me, however brief. Great Judith. Use those hand warmers in your socks or down boots. I used a lightweight builders mask to reduce the breath condensation. It does work. You might dream of doing plastering though. Ha. We need to get out but Sheila’s mam is back in intensive care. So hopefully we can get away tomorrow with her sister staying with us. I pulled my Buff over my mouth and nose to try to reduce the condensation. It’s only partially effective, though. I hope Sheila’s Mum is OK.
Mad heroes are the best kind. You are truly barking and that is what I admire in you most. Fabulous. I’ll definitely be going out in a tent rather than bivi. But I’m a southern softie. A good read. Good to see you’re still using the Vaude. The poles can be a bit funny but I found practice helps a lot. I can’t sleep with mine fully zipped up though- always have the nagging doubt I’ll suffocate. Do you do the trick of putting a windshield protector under or over your pad? No idea what their proper name is but you can get them in Poundland or Halfords and they’re used to stop ice forming on a car windshield. Anyhow they are very thin and light but reflect a surprising amount of heat back rather than losing it to the ground. I’ve found it best on top of the pad but other people think it’s more effective under the pad. No, I’ve not tried a relector under (or over) my sleeping mat. I didn’t feel any cold from under my foam mat apart from one time when I was slightly off the mat and touching the ground sheet. 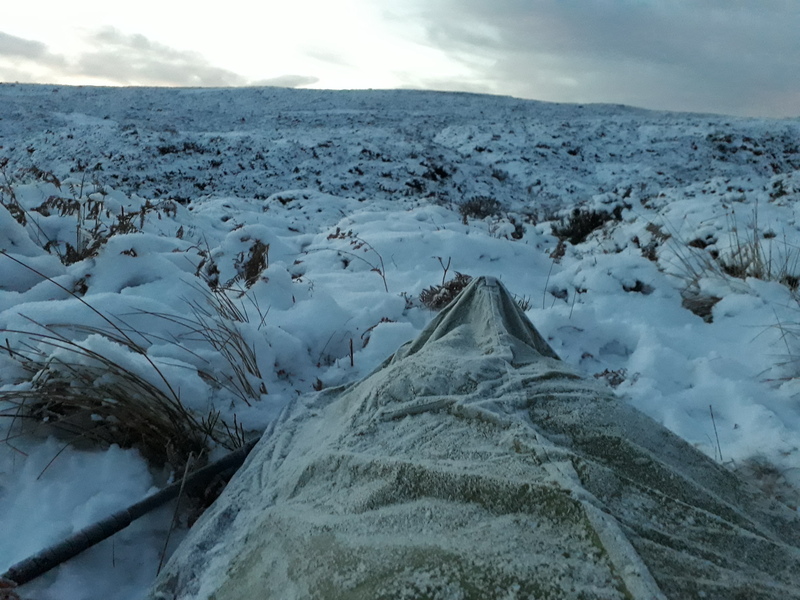 Frost formed on everything, so I needed to have the bivi zipped up nearly all the way so that I did not get ice on my sleeping bag. I did leave the top of the zip open a little. Feet on groundsheet – brrrrr at the best of times! I use a plastic washing line peg (the hinged in the middle type) to keep my Vaude open. I put it at the bottom near my face clipped over the zip – the top legs hold the Bivi door and when it’s zipped the peg creates a nice air gap. No water can get in as the flap covers the gap and the incoming air is cooler so it gives a gentle draught to help vent condensation. As I sleep on my left side the incoming air is exactly in the right place for me. Good clothes peg tip. Thanks!